The date that Pope Francis chose to begin the second phase of the Synod on the Family could hardly have been a coincidence. When the Synod opened yesterday on October 4, the Church celebrated the Feast of St. Francis of Assisi. And even more dramatically, the readings for the day celebrated marriage -- the marriage of Adam and Eve in the Garden of Eden and Jesus' plea that his people give up their hardness of hearts and treat marriage as indissoluble, the way it was meant to be from the beginning. The readings from the day give us hope. And three major themes from St. Francis' life give us hints as to how the Pope bearing his name intends to conduct the Synod. In a vision, St. Francis heard Christ telling him, "Go, rebuild my Church." Francis didn't understand at first what Christ meant. He wondered if his mission would be to repair a crumbling building. 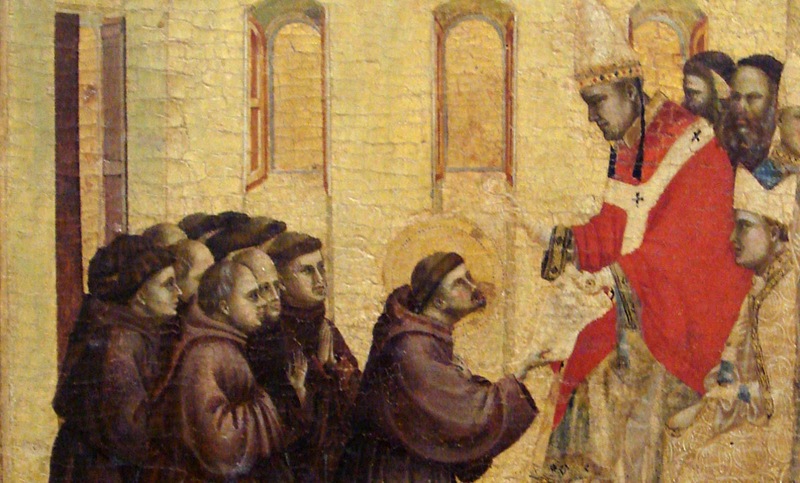 In time, St. Francis realized that the scope of his mission extended far more broadly. He was meant to reunite the people of the Church. In one of his most famous quotes, he described his calling: "We have been called to heal wounds, to unite what has fallen apart, and to bring home those who have lost their way." Pope Francis' task through the Synod of the Family and through his papacy in general is to rebuild the domestic church of the family. The "domestic church" is an ancient expression, highlighting the role of "believing families ... as centers of living, radiant faith"(CCC 1656). In our families, we learn how to love, how to work, how to forgive, how to pray, and how to endure (CCC 1657). We learn how to be Christ for one another and how to see Christ in one another. Today, the family is indisputably in crisis. Faith is in crisis as well. Young people are not getting married and they aren't going to Church. If the youth are our future, then where are we going? There is even a push by many German priests and bishops to reformulate Church doctrine on contraception, divorce, remarriage, and homosexual unions. Contentious arguments at synod meetings last October showed uncomfortable divisions between the princes of the Church. What we need badly from this year's discussions is for Pope Francis "to heal wounds, to unite what has fallen apart, and to bring home those who have lost their way." In the story of St. Francis and the wolf of Gubbio, the inhabitants of a small Italian town were being terrorized by a wolf attacking their livestock and even the humans themselves. The townspeople tried to destroy the wolf without success. But St. Francis went out to meet the wolf without fear. He invoked the name of God the Father, God the Son, and God the Holy Spirit. He spoke to Brother Wolf, told him to stop terrorizing the town, offered him mercy, and promised reconciliation with the townspeople. The wolf laid his paw in St. Francis' hand to show that he understood and agreed. The characteristics of the saint meld easily with the characteristics of the pope. Pope Francis has never sidestepped a controversial issue or question. He has offered mercy over and over again, to the divorced, to homosexuals, to women who have gotten abortions. He has embraced everyone from the disabled to the dissenters. We can hope that he will wrangle a reconciliation between arguing factions within the Church. The famous Prayer of St. Francis contains a line: "grant that I may not so much seek ... to be understood, as to understand." Pope Francis' words are often spun by misunderstanding media. When he says "Who am I to judge" homosexuals, some people assume the pope will change doctrine on homosexuality. When he says "the divorced are not excommunicated," they assume he will allow the divorced and civilly remarried to receive communion. When he says that Catholics don't have to "breed like rabbits," they assume he disapproves of large families. From numerous, less well-reported papal statements, it is clear that none of these assumptions is warranted. But Pope Francis has frequently been misunderstood. Moreover, he has been criticized for not being clear enough. But a hallmark of Pope Francis seems to be his desire to hear and to listen and to understand his people and their troubles. When he speaks, he responds in mercy to what he has heard. Truth is always clearer than mercy. It's more logical and it makes more sense. There is a certain illogic to mercy, but mercy nonetheless lies at the heart of Christianity. I remember when Saint John Paul II said: “Error and evil must always be condemned and opposed; but the man who falls or who errs must be understood and loved… we must love our time and help the man of our time” (JOHN PAUL II, Address to the Members of Italian Catholic Action, 30 December 1978). The Church must search out these persons, welcome and accompany them, for a Church with closed doors betrays herself and her mission, and, instead of being a bridge, becomes a roadblock. Like Francis, may we also seek to understand rather than condemn, to tame rather than destroy, and to bring home those who have lost their way. St. Francis, intercede for us, for the bishops, the Pope, the Synod, and the Church! Pope Francis seems to really have his pulse on what the people need to hear. His message is of hope and forgiveness though Jesus. To those who say he is not harsh enough, I reply that he is meeting people where they are and hopefully leading them where they need to be! Announcing the Free Marriage Rx E-Book!! BIG REVEAL: We Have a Book Cover! !